With thanks to Georgiansilver, who posted this quite beautiful - visually as well as musically - clip at Mudcat. Salut! Live wishes all readers a happy or, as I put it in a gloomy piece due to be published by The National on New Year's Eve, resilient new year. For the first time since I began nominating my folk CD/s of the year, an entirely subjective exercise though I have been lucky enough to have platforms for my views for 20 years or more, I found myself stumped. There was not one clear winner; there were two: Eliza Carthy's outstanding Dreams of Breathing Underwater being caught at the last minute by Cara Dillon's spellbinding Hill of Thieves. An Englishwoman who has given a mountain of service to folk, whatever she chooses - we choose - to call her music now, shares the Salut! Live honours, as performer of the best CD of 2008, with one of the best singers to emerge from Northern Ireland/north of Ireland in decades. This is simply one man's opinion, of course. It is not even the opinion I gave in my response to the fRoots and BBC critics' polls, for the simple reason that Dillon's album had not even reached me in the UAE when the deadlines for those nominations were looming. * one obvious ps concerns the criteria applied in composing the list. No, I do not see every folk CD. Now that I live in the Gulf, and am no longer the folk critic of The Daily Telegraph, agents and record companies feel much less need to bombard me with everything that is released. So I rely on those that are sent to me, by the people who have dealt with me long enough to know whether I am likely to try to make use of them, and those I buy myself. Thirty years have passed since Sandy Denny, a young woman with the voice of an angel but a taste for hard living, suffered a brain haemorrhage while staying with a friend in London. Just 31, she slipped into a coma and died. She left a young daughter, large numbers of adoring fans and a fair body of recorded work that was to trickle out in various forms over the next three decades. To coincide with this year’s anniversary of her death, the BBC produced a radio documentary named in part after her most famous song, Who Knows Where The Time Goes? 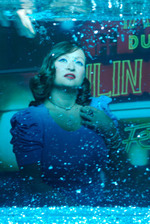 The project echoed a recent explosion of interest in the singer far in excess of the attention she commanded when alive. And just when it seemed there could surely be nothing more to say or hear, that every radio and television library, record label archive and attic had been combed for material to satisfy the fascination with her life and work, another Sandy Denny album has surfaced. The story of Fotheringay’s 2, the follow-up record that took 38 years to complete and release, is an extraordinary one. Who, indeed, knows where the time went? No sooner had I voted in the BBC Folk Awards for Bellowhead's Fakenham Fair as my traditional track of the year, and Eliza Carthy's Mr Magnifico in the contemporary category, than along comes something that knocks spots off both of them. I am talking about Spencer the Rover, which appears on Cara Dillon's outstanding new album, Hill of Thieves, on her own Charcoal label. Some people are altogether too clever. Others just paid attention at school. Those paying attention at Salut! Live will have seen my reference to the delicious Sandy Denny/Fotheringay anecdote from the Manchester gig where, in response to repeated demands Banks of the Nile, the band appeared to relent - only to bash out Memphis Tennessee. I wonder if Sandy remembered that Memphis Tennessee takes its name from Memphis in Egypt - which is indeed on the banks of the Nile? I will not say it was the highlight of an enthralling holiday. But to Memphis, ancient capital of Egypt, I duly went. There was not a great deal to explore - most of what remains of the old city is at the museum where the main picture was taken - but it had to be seen. Private Beach's theory seemed so compelling that I abandoned my assumption that the band intended no more than a gag. Of course, I told myself, one or more of them must have known precisely what they were doing.